Genetically encoded fluorescent biosensors have revolutionized the study of signal transduction by enabling the real-time tracking of signaling activities in live cells. Investigating the interaction between signaling networks has become increasingly important to understanding complex cellular phenomena, necessitating an update of the biosensor toolkit to allow monitoring and perturbing multiple activities simultaneously in the same cell. We therefore developed a new class of fluorescent biosensors based on homo-FRET, deemed FLuorescence Anisotropy REporters (FLAREs), which combine the multiplexing ability of single-color sensors with a quantitative, ratiometric readout. Using an array of color variants, we were able to demonstrate multiplexed imaging of three activity reporters simultaneously in the same cell. We further demonstrate the compatibility of FLAREs for use with optogenetic tools as well as intravital two-photon imaging. Genetically encoded biosensors have revolutionized the study of cell signaling by allowing the real-time monitoring of signaling activities, such as enzymatic activity or the release of second messengers, in live cells. They are therefore critical tools for uncovering the precise spatial and temporal regulation of signal transduction cascades. These biosensors can be divided into two broad classes: single-color and ratiometric. Single-color sensors, with an intensiometric activity readout, only occupy a single-color channel, allowing for more flexibility in multiplexed imaging experiments. However, they are sensitive to variations in probe concentration caused by changing expression levels or cell shape, as well as differences in imaging conditions, such as illumination intensity and focus. On the other hand, sensors with a ratiometric readout, such as those based on Förster Resonance Energy Transfer (FRET), cancel out many of these variations, enabling quantitative measurements of second messenger concentrations and better comparisons between experiments. However, the requirement for two distinct color channels limits their application in multiplexed imaging. We therefore aimed to develop sensors that only occupy a single channel while still cancelling out the effects of varying imaging conditions and probe concentrations. Hence, rather than using the emission ratio between the FRET and donor channels, we instead used the loss of polarization of emitted light as a readout for FRET between two fluorescent proteins (FPs). Because this approach does not require the donor and acceptor to have distinct emission wavelengths, it can be used for either hetero-FRET (e.g. between different chromophores) or homo-FRET (e.g. between identical chromophores). Homo-FRET measurements have been useful for detecting protein clustering and protein oligomerization in live cells (Bader et al., 2011, 2009; Gautier et al., 2001), but only recently has the possibility of using homo-FRET in biosensor designs been explored (Warren et al., 2015; Cameron et al., 2016). Here, we describe the development of a panel of single-color, genetically encodable biosensors based on homo-FRET for detecting kinase activity and second messenger dynamics. We call these sensors FLuorescence Anisotropy REporters, or FLAREs. To create our FLARE probes, we adapted existing FRET-based biosensors for homo-FRET measurements by replacing the traditional FRET pair with two FPs of the same color. The resulting biosensors include a molecular switch, which changes conformation in the presence of a particular biochemical activity, flanked by two spectrally similar FPs at the N- and C-termini. Changes in the conformation of the molecular switch, and thus the biochemical activities under study, are then monitored by observing the fluorescence anisotropy of the sensor using fluorescence polarization microscopy, with increased anisotropy corresponding to a lower-FRET state of the sensor, similar to the effect of increasing the intramolecular distance between the FRET pair (Figure 1—figure supplement 1). Design and characterization of FLARE AKAR. (a) Schematic of a kinase activity FLARE (b) Diagram illustrating domain structure of FLARE-AKAR (top). Time-course of mean fluorescence anisotropy of Venus-cp172Venus FLARE-AKAR wild type (blue, N = 44) and kinase insensitive T-to-A mutant (red, N = 38) expressed in HEK293T cell, stimulated with 50 μM forskolin and 100 μM IBMX at t = 0 min, and 20 μM H-89 at t = 24 min (left). Dashed lines above and below represent standard error of the mean. Changes in anisotropy upon Fsk/IBMX stimulation for both FLARE-AKAR WT and T-to-A mutant (upper right, two-tailed t-test, p<0.0001), calculated as the difference between the mean anisotropy from t = 5 min to t = 7.5 min and the mean anisotropy of the baseline before drug addition. The mean for each is shown, with the error reflecting the standard error of the mean. Representative anisotropy pseudocolor image before Fsk/IBMX stimulation (t = 0 min), after Fsk/IBMX stimulation (t = 7.5 min), and after inhibition of PKA with H-89 (t = 24 min) (lower right) (c) Comparison of the magnitude of the anisotropy change for different color variants of FLARE-AKAR upon stimulation with Fsk/IBMX including Venus-cp172Venus AKAR (N = 44), Venus-Venus FLARE AKAR (N = 32), EGFP-EGFP FLARE AKAR (N = 13), mCh-mCh FLARE AKAR (N = 22), mCerulean3 FLARE-AKAR (N = 10), and mCerulean3-cp173Cerulean FLARE-AKAR (N = 26). The mean for each is shown, with the error reflecting the standard error of the mean. observations in hetero-FRET-based biosensors (Nagai et al., 2004; DiPilato and Zhang, 2009a; Allen and Zhang, 2006). We observed a slight positive correlation between intensity and anisotropy change for Venus-cp172Venus FLARE AKAR; however, the expression level does not significantly impact the reporting ability of these sensors in general (Figure 1—figure supplement 3a). The signal-to-noise ratio (SNR) of Venus-cp172Venus FLARE-AKAR was calculated to be 32 by dividing the magnitude of the anisotropy change upon maximal PKA stimulation by the standard deviation of the baseline before stimulation. Subsequent control experiments confirmed that this change in anisotropy is caused by a change in the FRET state due to the conformational change of the sensor upon stimulation of PKA activity. PKA inhibition using 20 μM H-89 led to an immediate slope change and increase in anisotropy (Figure 1b). On the other hand, a mutant version of the biosensor with a threonine-to-alanine (T-to-A) mutation at the phosphorylation site showed no change in anisotropy upon PKA stimulation with Fsk/IBMX or inhibition with H-89 (Figure 1b, Figure 1—figure supplement 2b), suggesting that the observed changes in anisotropy were due to phosphorylation of the PKA substrate. Furthermore, isoproterenol, a β-adrenergic agonist, induced FLARE-AKAR responses in a dose-dependent manner (Figure 1—figure supplement 4). To further demonstrate that the change in anisotropy upon PKA stimulation was due to a change in FRET, we mutated the chromophore of the C-terminal cp172Venus in Venus-cp172Venus FLARE AKAR from GYG to GGG. We observed that the magnitude of the response to Fsk/IBMX decreased to approximately one-third of that of the wild-type sensor (Figure 1—figure supplement 5). The remaining response was likely due to intermolecular FRET that occurs when the FHA1 domain of one molecule binds to the phosphorylated PKA substrate in an adjacent molecule. In addition to the yellow sensors, we developed a panel of color variants of FLARE-AKAR, including EGFP-EGFP, mCherry-mCherry, mCerulean3-mCerulean3 (Markwardt et al., 2011), and mCerulean3-cp173Cerulean3 versions. All these variants exhibited a decrease in anisotropy in cells treated with Fsk/IBMX; however, the magnitude of the anisotropy decrease depended on the choice of FP, with the mVenus-cp172Venus variant having the largest response (Figure 1c, Figure 1—figure supplement 2). As with the Venus variants, the Cerulean3-based FLARE-AKAR showed an increased dynamic range with a circularly permutated fluorescent protein at the C-terminal position. mCherry-mCherry FLARE-AKAR, being spectrally shifted from the AKAR4 heteroFRET sensor allowed for direct comparison of FLARE and heteroFRET sensors within the same cell. As shown in Figure 1—figure supplement 6, changes in anisotropy in mCherry-mCherry FLARE-AKAR corresponded with the changes in normalized emission ratio in AKAR4, with similar kinetics. We furthermore demonstrated the ability of FLARE-AKAR sensors to monitor kinase activity at particular subcellular compartments. By fusing Venus-cp172Venus FLARE-AKAR to targeting motifs from Lyn kinase and DAKAP1, we were able to detect PKA activity at the plasma membrane and outer mitochondrial membrane, respectively (Figure 1—figure supplement 7). Moreover, we used untargeted FLARE sensors to detect differential PKA activity dynamics in different compartments; diffusable Venus-cp172Venus FLARE AKAR in HeLa showed that PKA activity has slower kinetics and a lower magnitude in the nucleus than the cytosol (Figure 1—figure supplement 8). To demonstrate the generalizability of FLAREs, we developed a family of single-color kinase activity or activation reporters in various colors (Figure 2). To construct a single-color Erk activity biosensor, we replaced the PKA sensor domain from Venus-cp172Venus FLARE-AKAR with the sensor domain from EKAR-EV, composed of a WW domain (PAABD), a flexible EV linker, and an Erk substrate peptide (Figure 2a) (Harvey et al., 2008; Vandame et al., 2014). When expressed in HEK293T cells, Venus-cp172Venus FLARE-EKAR-EV exhibited a decrease in anisotropy of 0.02 ± 0.001 (N = 13) after treatment with 100 ng/mL epidermal growth factor (EGF) to activate the MAPK pathway (Figure 2a, Figure 2—figure supplement 1). This response was reversed upon MEK inhibition using 20 μM U0126, and no change in anisotropy was observed with a T-to-A mutant sensor. 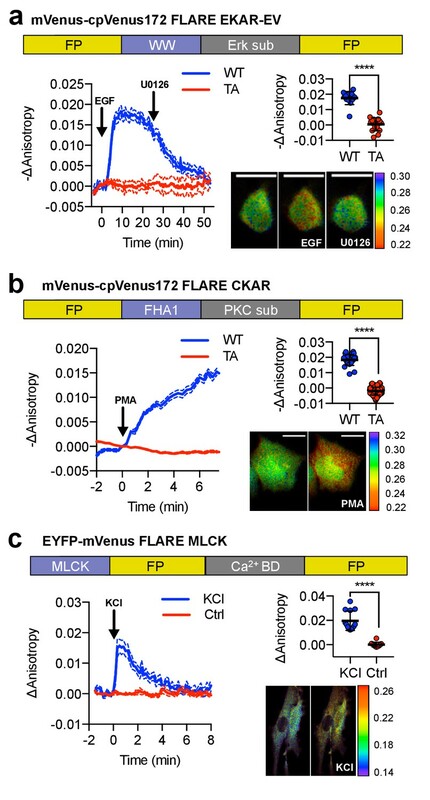 Likewise, we developed a panel of PKC activity reporters, called FLARE-CKARs, by flanking a PKC sensor domain composed of an FHA1 domain and a PKC substrate (Herbst et al., 2011) from a CKAR2 construct (Figure 2—figure supplement 2) with mVenus-cp172Venus. We observed an anisotropy decrease of 0.02 ± 0.001 (N = 26) upon activation of PKC with 100 ng/mL phorbol 12-myristate 13-acetate (PMA) (Figure 2b, Figure 2—figure supplement 3). For both FLARE-EKAR (Figure 2—figure supplement 1) and FLARE CKAR (Figure 2—figure supplement 3), we likewise repeated this process for various color variants, and like the FLARE-AKARs, the sensors based on mVenus exhibited the largest responses. Furthermore, a myosin light chain kinase (MLCK) sensor was converted to a FLARE by exchanging the cyan FP for mVenus (Isotani et al., 2004). Calmodulin (CaM) association with the MLCK-CaM binding domain in between the FPs decreases FRET, leading to an increase in fluorescence anisotropy upon forced calcium (Ca2+) entry with 30 mM KCl (N = 13) (Figure 2c, Figure 2—figure supplement 4). A panel of kinase activity and activation biosensors. (a) Domain structure of FLARE-EKAR-EV (above). Time-course of mean fluorescence anisotropy of Venus-cp172Venus FLARE-EKAR-EV WT (blue, N = 13) and kinase-insensitive mutant (red, N = 16) expressed in HEK293T cell, with addition of 100 ng/mL EGF at t = 0 min and 20 μM U0126 at t = 25 min (left). Summary of anisotropy changes (upper right, two-tailed t-test, p<0.0001), calculated as the difference between the mean anisotropy from t = 10 min to t = 15 min and the mean anisotropy of the baseline before drug addition. The mean is shown, with the error reflecting the standard error of the mean. Representative anisotropy pseudocolor image before EGF stimulation (t = 0 min), after EGF stimulation (t = 25 min), and after inhibition of MEK with U0126 (t = 47.5 min) (lower right). (b) Domain structure of FLARE-CKAR (above). Time-course of fluorescence anisotropy of Venus-cp172Venus FLARE-CKAR WT (blue, N = 26) and kinase-insensitive mutant (red, N = 119) with addition of 100 ng/mL phorbol 12-myristate 13-acetate (PMA) at t = 0 min. Summary of response magnitudes (upper right, two-tailed t-test, p<0.0001), calculated as the difference between the mean anisotropy from t = 10 to t = 11.33 min and the mean anisotropy of the baseline before drug addition. The mean is shown, with the error reflecting the standard error of the mean. Representative anisotropy pseudocolor image before PMA addition (t = 0 min) and after PMA addition (t = 15 min). (c) Domain structure of FLARE-MLCK (top). Anisotropy time course of a representative REF52 cell expressing YFP-Venus FLARE-MLCK treated with 30 mM KCl at t = 0 (N = 13, blue), or vehicle control (N = 10). Summary of anisotropy changes, calculated as the mean difference between the anisotropy at t = 0.333 min and the anisotropy of the baseline, before KCl addition (upper right, two-tailed t-test, p<0.0001). Representative pseudocolor anisotropy images before and after KCl treatment (lower right). Dashed lines above and below time course traces reflect the standard error of the mean. FP, fluorescent protein; CaM BD, MLCK calmodulin-binding domain. Design and characterization of FLARE second messenger biosensors. (a) Schematic of FLARE ICUE cAMP biosensor. (b) Domain structure of FLARE-Cameleon (top). Time-course of mean fluorescence anisotropy of Venus-cp172Venus FLARE-Cameleon (N = 10) with addition of 1 μM ionomycin and 5 mM CaCl2. Summary of anisotropy changes after 1 μM ionomycin and 5 mM CaCl2 (upper right) calculated as the difference between the mean anisotropy from t = 5 min to t = 7.5 min and the anisotropy of the baseline before drug addition Representative anisotropy pseudocolor image before and after 1 μM ionomycin and 5 mM CaCl2 addition. (c) Domain structure of the cAMP biosensor FLARE-ICUE (top). Time-course of mean fluorescence anisotropy of Venus-cp172Venus FLARE-ICUE (N = 40) with addition of 50 μM forskolin and 100 μM IBMX at t = 0 (left). Summary of anisotropy changes after 50 μM forskolin and 100 μM IBMX with respect to baseline (upper right), calculated as the difference between the mean anisotropy from t = 5 min to t = 7.5 min and the anisotropy of the baseline before drug addition. Representative anisotropy pseudocolor image before (t = 0 min) and after (t = 7.5) stimulation with Fsk/IBMX (lower right). Dashed lines above and below time course reflect standard error of the mean. FLARE sensors than mCerulean3 or mCherry variants, likely due to the superior extinction coefficient and quantum yield of mVenus, which make it a good FRET donor and acceptor. We further demonstrated the ability of Venus-cp172Venus FLARE Cameleon to detect submaximal responses by monitoring calcium transients in histamine-stimulated HeLa cells (Figure 3—figure supplement 1c). In order to determine the dissociation constant and Hill coefficients, we purified Venus-cp172Venus Cameleon and measured the fluorescence anisotropy in solutions of known free Ca2+ concentration at different temperatures (Figure 3—figure supplement 2). The resulting parameters are in good agreement with other Cameleon sensors (Nagai et al., 2004). Furthermore, we developed another calcium FLARE sensor, based on D1-ER (Palmer et al., 2004), with a sensitivity appropriate for calcium monitoring in the ER. The anisotropy decreases upon increasing calcium concentration and increases when calcium is depleted from the ER upon treatment with thapsigargin (Figure 3—figure supplement 3). In addition to Ca2+, we developed a FLARE to detect intracellular cAMP based on the ICUE family of sensors, in which a conformational change in a truncated form of the cAMP effector Epac leads to a decrease in FRET efficiency in the presence of cAMP (DiPilato and Zhang, 2009b) (Figure 3a). When expressed in HEK293T cells, the fluorescence anisotropy of Venus-cp172Venus FLARE-ICUE increased by 0.02 ± 0.001 (N = 40) upon stimulation with Fsk/IBMX (Figure 3c, Figure 3—figure supplement 4). The fact that FLAREs only occupy a single-color channel and are highly generalizable for different biosensors, as well as color variants, highlights their utility for multiplexed imaging applications. While multiplexing of hetero-FRET sensors is generally limited to two probes (Depry et al., 2013; Shcherbakova et al., 2012), we demonstrate that FLAREs can facilitate co-imaging of three biosensors simultaneously. We co-expressed mCherry-mCherry FLARE-AKAR, Venus-cpVenus FLARE-EKAR-EV, and mCerulean3-mCerulean3 FLARE-Cameleon in HEK293T cells and acquired a time-course with sequential treatment using Fsk/IBMX, EGF, and thapsigargin. Clear and distinct decreases in anisotropy were observed in the red channel after Fsk/IBMX treatment, in the yellow channel after EGF stimulation, and in the cyan channel after thapsigargin treatment, corresponding to an increase in PKA activity, Erk activity, and intracellular Ca2+, respectively (N = 17) (Figure 4a, Figure 4—figure supplement 1). (a) Time-course of a representative HEK293T cell co-expressing mCherry-mCherry FLARE-AKAR, mVenus-cp172Venus FLARE-EKAR-EV, and mCerulean3-mCerulean3 FLARE-Cameleon, with 50 μM forskolin and 100 μM IBMX added at t = 0 min, 100 ng/mL EGF at t = 7.5 min, and 1 μM thapsigargin added at t = 32.5 min (N = 17). (b) Anisotropy response of a representative MIN6 cell co-expressing Cerulean3-Cerulean3 FLARE-Cameleon and Venus-cp172Venus FLARE-ICUE, showing robust oscillations after stimulation with TEA at t = 0 min (N = 19). (c) Venus-cp172Venus FLARE-Cameleon anisotropy time-course in REF52 cells co-expressing the sensor and either mCherry-tagged humanized channel rhodopsin2 (blue-curve) or mCherry alone (red-curve), with periodic illumination with 455 nm light (indicated by cyan shading). (d) Purified mVenus and mCherry proteins were placed in separate capillary tubes and imaged with 855 nm and 1200 nm two-photon excitation. 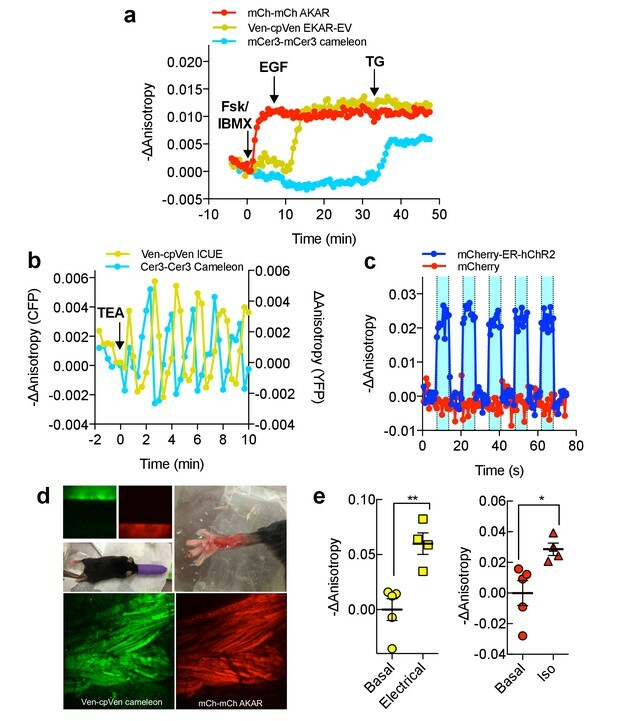 Plasmids encoding Venus-cp172Venus FLARE-Cameleon and mCherry-mCherry FLARE-AKAR were electroporated into the skeletal muscle of the foot of a live mouse for in vivo imaging. Below are Z-stack projections of skeletal muscle co-expressing these two sensors, excited with 855 nm (left) and 1200 nm (right) light. (e) Electrical stimulation decreased fluorescence anisotropy in the 855 nm channel, consistent with increased cytoplasmic Ca2+ (left) (two-tailed T-test, p=0.0037). Intraperitoneal injection of isoproterenol activates mCherry-mCherry FLARE AKAR (two-tailed T-test, p=0.0239), as indicated by decreased anisotropy in the 1200 nm channel (right). The mean for each is shown, with the error reflecting the standard error of the mean. We further aimed to show that FLARE sensors can be used to monitor multiple signaling activities simultaneously in different cellular contexts. For example, mCer3-mCer3 FLARE Cameleon, co-imaged with other FLARE sensors in HeLa cells, can detect calcium responses to physiologically relevant stimulation conditions, such as histamine (Figure 4—figure supplement 2). Additionally, when mCer3-mCer3 FLARE AKAR was co-imaged with Venus-cp172Venus cameleon in HEK293T cells, activation of the β-adrenergic with isoproterenol led to a transient decrease in anisotropy in the cyan-channel (Figure 4—figure supplement 3). Furthermore, we used FLAREs to study the cAMP-Ca2+ oscillatory circuit in pancreatic β-cells. 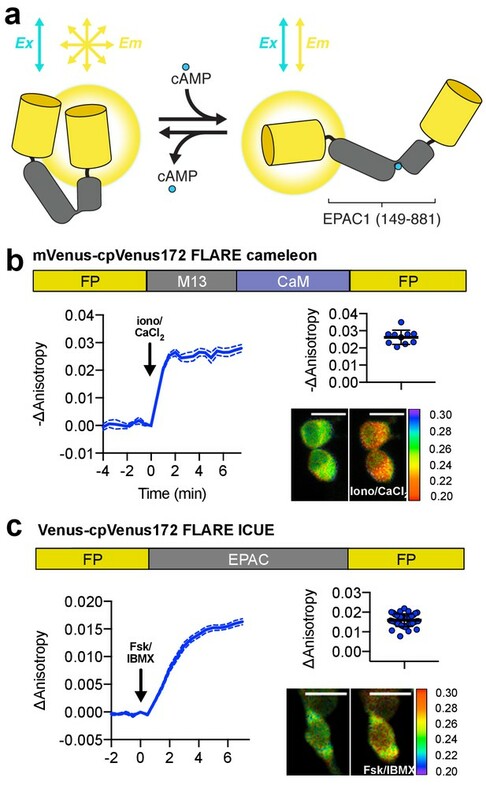 MIN6 β-cells were transiently transfected with Venus-cp172Venus FLARE-ICUE and mCerulean3-mCerulean3 FLARE-Cameleon to simultaneously monitor cAMP and Ca2+ ﻿dynamics, respectively (N = 19). We observed clear fluorescence anisotropy oscillations in both channels following stimulation with 20 mM tetraethylammonium chloride (TEA) (Figure 4b, Figure 4—figure supplement 4). Ca2+ and cAMP exhibit synchronized oscillations, with Ca2+ increases corresponding to cAMP decreases, consistent with previous findings (Landa et al., 2005; Ni et al., 2011). These data demonstrate that even the lower signal mCerulean3-based FLARE sensors can be used under sub-maximal and physiologically relevant stimulation conditions in multiplexed imaging experiments. ER-targeted channelrhodopsin2 (hChR2) (Nagel et al., 2003; Lin et al., 2009; Markwardt et al., 2016), a light-gated calcium ion channel, with Venus-cp172 FLARE-Cameleon in REF52 cells, a rat embryonic fibroblast cell line. Illumination with blue light produced an immediate decrease in anisotropy, corresponding to an increase in intracellular Ca2+ (Figure 4c, Figure 4—figure supplement 5). Control cells lacking hChR2 expression showed no change in anisotropy in the yellow channel. In vivo, two-photon imaging of FLAREs was tested using a skeletal muscle preparation (Figure 4d,e). Exclusive excitation of mVenus (855 nm) or mCherry (1200 nm) was verified by imaging capillary tubes filled with recombinant proteins (Figure 4d). Plasmids encoding Venus-cp172Venus FLARE-Cameleon and mCherry FLARE-AKAR sensors were electroporated into the flexor digitorum brevis muscle of a live mouse (DiFranco et al., 2009; Kerr et al., 2015). Administration of an electrical current stimulated a rise in intracellular Ca2+ concentration, as indicated by a decrease in FLARE-Cameleon anisotropy, independent of changes in FLARE-AKAR anisotropy (Figure 4e). Activation of AKAR was then induced by intraperitoneal injection of isoproterenol (0.5 mg/kg). Thus, FLAREs enable in vivo multiparametric biosensor measurements. We have demonstrated that FLAREs are a highly generalizable, accessible platform for creating single-color sensors to detect biochemical activities in individual cells in real time. Their ratiometric readout allows for fluctuations in light intensity and probe concentration to be cancelled out, permitting quantitative measurements of intracellular concentrations. We showed that these sensors have an SNR of 3–32 (Table 1) and a dynamic range comparable with first-generation FRET sensors (Newman and Zhang, 2008; Zhou et al., 2015). Future development and optimization should further enhance their performance. We demonstrated that current FLAREs are already useful for multiplexed imaging applications. They can also be used in conjunction with optogenetic tools to enable all-optical interrogation of cellular regulation, and for intravital two-photon imaging to facilitate studies in tissues and living animals. FLAREs, by allowing researchers to monitor multiple activities within the same cell, as well as to both monitor and optogenetically perturb activities in the same cell, could be used to study the how the spatiotemporal regulation of biochemical activities in highly integrated pathways allows a small number of signals to produce diverse cellular behaviors. Signal to noise ratios for FLARE biosensors. Cloning was performed using the pRSET-B vector using typical molecular cloning methods using polymerase chain reaction (PCR) with Phusion polymerase (New England Biolabs), restriction enzyme digestion, and ligation with T4 DNA ligase. To clone Venus-cp172Venus FLARE, AKAR4 was sub-cloned from a modified pCDNA3 to pRSET-B between the BamHI and EcoRI restriction enzyme sites. mVenus was then PCR amplified with primers encoding a BamHI site at the 5’ end and an SphI site at the 3’ end, and the resulting PCR product was digested with BamHI and SphI and ligated to pRSET-B AKAR4 digested with BamHI and SphI, with the mCerulean gene removed. Venus-cp172Venus FLARE AKAR was then sub-cloned back into a modified pCDNA3 vector using the BamHI and EcoRI sites. Other color variants were created by replacing the genes for the fluorescent proteins in other FLARE AKAR variants in pRSET-B, either between the BamHI and SphI sites for the N-terminal fluorescent protein, or SacI and EcoRI for C-terminal fluorescent proteins. Finalized constructs intended for mammalian expression were then sub-cloned into a modified pcDNA3 expression vector between the BamHI and EcoRI sites. FLARE variants of other sensors were created by amplifying the molecular switch from EKAR-EV, CKAR2, Cameleon and ICUE3 with primers encoding the SphI and SacI sites, digesting the PCR product with SphI and SacI enzymes, and ligating them to the relevant pRSET-B FLARE AKAR plasmid digested with SphI and SacI to remove the domains involved in the molecular switch for FLARE AKAR. The final constructs were then subcloned into a modified pCDNA3 expression vector between the BamHI and EcoRI sites. Targeted versions of the sensors were created either by PCR amplifying the sensor with primers containing the targeting sequence and ligating it to the pCDNA3 expression vector between BamHI and EcoRI, or by subcloning the construct into a plasmid already containing the targeting sequence. N-terminal targeting sequences were placed between HindIII and EcoRI, and C-terminal targeting sequences between EcoRI and XbaI. All cloning steps were performed using DH5α strain of E. coli. The threonine to alanine mutants for Venus-cp172Venus FLARE AKAR and FLARE EKAR were created by performing site-directed mutagenesis using a standard single-primer PCR-based protocol. The threonine to alanine mutant for Venus-cp172Venus FLARE CKAR, as well as the chromophore-dead variant of Venus-cp172Venus FLARE AKAR, was created using Gibson assembly, amplifying the appropriate fragment with a primer containing the desired mutation. The YFP MLCK FLARE sensor was created by replacing the CFP portion of an existing two color sensor (Isotani et al., 2004; Geguchadze et al., 2004) with a PCR amplified mVenus fragment flanked by XhoI and AgeI restriction sites. Moreover, the coding sequence for the CFP D1 ER sequence was manufactured by Genewiz. The sensor consists of two oxmCer3 proteins (https://www.ncbi.nlm.nih.gov/pubmed/26158227) flanking the D1 ER calcium sensing domains (Palmer et al., 2004) and a C-terminal KDEL ER retention sequence. HEK293T and HeLa cells cells were maintained using Dulbecco’s Modified Eagle’s Medium (DMEM) supplemented with 10% fetal bovine serum (FBS) and 1% penicillin/streptomycin. Cells were seeded onto a 35-mm glass-bottom imaging dish and incubated at 37°C with 5% ambient carbon dioxide. HEK293T, HeLa, MIN6, and REF-52 cell lines were maintained separately from other cells and were screened regularly to confirm the absence of mycoplasma contamination using Hoechst staining. As the origin of the cells was not central to the nature of these experiments, we did not further validate the identity of the cell lines. Cells were transfected using Lipofectamine 2000 (Invitrogen), Polyjet (SignaGen), or calcium phosphate and incubated for 12–48 hr before imaging. The growth media was removed immediately before imaging, and the cells were washed two or more times with Hanks Balanced Salt Solution (HBSS) buffer with glucose at room temperature. The cells were imaged in HBSS buffer with glucose at either room temperature or 37°C. Widefield images were collected using an Zeiss AxioObserver equipped for fluorescence polarization microscopy, using one of two setups. In the first setup, a wire grid polarizer (Meadowlark Optics) was placed in the excitation pathway between the LED illuminators and reflector turret containing filter cubes specific for CFP (Zeiss), YFP (Zeiss), and mCherry (Semrock). Images were generally collected using a 20 × 0.75 NA objective lens. Polarizations parallel and perpendicular to the excitation polarizations were separated using Optical Insights Dual-View using their polarization splitting module. Both images were simultaneously collected in a single image collected by a water-cooled Orca-R2 (Hamamatsu). In the second setup, a polarizer (Chroma) was placed in the excitation pathway between the xenon arclamp and the excitation filters. Images were collected using a 20 × 0.45 NA objective lens. Polarizations were separated using an Opto-Split II LS image splitter, with two wire grid polarizers (Meadowlark) oriented parallel and perpendicular to the excitation polarizer. Images of both polarizations were collected using a Hamamatsu Flash 4.0 sCMOS camera. Two-photon imaging was performed using a Zeiss 7 MP with GaAsP non-descanned detectors housed at the University of Maryland School of Medicine confocal facility. Coherent Chameleon and OPO lasers were used for excitation. Fluorescence was filtered using an ET680 short pass filter for two-photon microscopy (Chroma) prior to separating polarizations with a one inch broadband polarizing beamsplitter cube (Thorlabs) mounted using a custom 3D printed cube. Images were collected using a 10×, 0.3 NA Plan-apochromat objective lens. In vivo imaging was performed on C57Bl/6 mice under isoflurane anesthesia. where g is the correction factor that accounts for differences in polarization transmission efficiencies within the instrument. The g-factor was calculated using an isotropic fluorescein solution as described by Piston and Rizzo (2008). Anisotropy was calculated by subtracting the anisotropy at each time point by the anisotropy at the time point right before drug addition. The magnitude of the anisotropy changes were calculated by taking the difference between the average anisotropy when the signal peaked or plateaued and the average anisotropy of the baseline time points before drug was added. Purification of the FLARE-Cameleon sensors was done using the BL21-RIL Codon Plus strain of E. coli, which were transformed with the construct cloned in the pRSET-B vector, with a Poly-His tag in the header sequence to allow for metal ion binding. The cells were grown to an OD of 0.2, when expression was induced with IPTG and allowed to grow overnight. The cells were then pelleted, frozen, resuspended, and lysed by sonication. Protein purification was performed using column chromatography with Ni-NTA resin. Fractions were collected and analyzed using SDS-PAGE; fractions showing sufficiently pure protein product were pooled. Biochemical and Biophysical Research Communications 348:716–721. Pflügers Archiv - European Journal of Physiology 465:373–381. Journal of Visualized Experiments 1520. Journal of the American Chemical Society 133:5676–5679. Journal of Biological Chemistry 280:31294–31302. Journal of Biological Chemistry 291:3000–3009. Methods in Cell Biology 85:415–430. Journal of the American Chemical Society 134:7913–7923. International Journal of Molecular Sciences 16:14695–14716. Thank you for submitting your work entitled "FLAREs: Single-color, ratiometric biosensors for detecting signaling activities" for consideration by eLife. Your article has been reviewed by two peer reviewers, and the evaluation has been overseen by a Reviewing Editor and a Senior Editor. - The concept is novel and the work is potentially a strong candidate for eLife. Observation of three different signaling events in parallel is important. However, a reviewer mentioned during the post-review discussion that three reporters in parallel is not by itself new. - Testing was only done under signal optimal conditions. Example seems cherrypicked. - Unclear how "usable" the technology will be. A more thorough characterization and comparison to current technology is needed. - The MAPK sensor clearly should behave differently. The other sensors are also not well characterized. - Cell population behaviors can be shown (e.g. multiple cell trajectories, average, stdev,.…). This would allow to get from anecdotal results to a real understanding of the robustness of the cell responses and biosensors. The reviewers were generally positive about the approach but suggest a number of new experiments to validate the method and demonstrate the usability, and to characterize the reporters in more depth. Although I suspect not all the experiments are necessary to address their comments adequately.eLife. If a new manuscript is submitted that addresses the point in the future, we will be happy to consult the same reviewers. The authors re-engineer a number of classic FRET-based biosensors (PKA, ERK, PKC, MLCK, calcium, cAMP) biosensors using single color FPs that perform homo FRET, and that can be measured using fluorescence anisotropy measurements. Since each biosensor is based on only one color, this allows for multiplexed biosensor measurements in single living cells. It also allows to perform biosensor measurements in response to optogenetic activation. Finally, the authors perform some in vivo fluorescence anisotropy measurements using 2-photon microscopy. The data somehow implies that a combination of mVenus and a cp mutant of Venus cp172-mVenus is the best pair for performing such anisoptropy measurements. It looks like that other pairs involving other color FPs perform much poorly. The authors propose that this can be a generalizable method to perform multiplexed imaging of multiple signaling activities in single living cells. While I like the concept, I think that the method might not be so easy to implement than as proposed. Multiplexed imaging has been performed using experiments that induce very robust signaling states. The poorest performing FP combination has been grafted on a calcium sensor that is known to be one of the most robust signaling modules available. The question is therefore if the approach has the full potential that the authors propose. This detracts my enthusiasm for the manuscript, and I do not think it is publishable in the present form. 1) Throughout the paper, the authors analyse multiple cells for each respective experiment. Could the authors please show a representation of all of these curves with median, stdev, and accompanying statistics. That would really help the reader to get a sense of the robustness of the biosensor responses. 2) It would be helpful if the authors would calculate the SNR for all the biosensors, as they have performed for their AKAR-FLARE sensor. With 1. This would again give an idea about the robustness of the sensor. 3) The FLARE-EKAR EV sensor in Figure 2A displays sustained ERK activity in response to EGF stimulation, and is then switched off using a MEK inhibitor. This is contrary to another EKAR variant, EKAR2G, that displays a very transient ERK activity in the same HEK293T cells (PMID:23882122). Importantly, this is backed up with a phosphoERK western blot in this paper. What happens with this FLARE EKAR-EV version. Do the new FPs somehow influence the biosensor response, or is this due to the specific HEK293T cells/ experimental conditions used by the authors? 4) Figure 4A: from 9 cells, the authors imply that there are two dynamic signaling states in that experiment. I think that if they want to make a statement about something like this, they need to acquire much more cells, and avoid showing anecdotal data. 5) I think that one of the weaknesses of the paper is that they remain elusive about the microscopy setup, and the image analysis of the datasets. Obviously, all this information is published elsewhere. But this being a technology resource paper, I think that it would really make sense to discuss this in detail both of these aspects to make the reader more familiar with this imaging technology. The study of molecular dynamics in single cells has revealed unexpected complexity, only tractable by multiplexing molecular biosensors. Ross, et al. explore the use of fluorescence anisotropy to measure conformational changes in genetically encoded biosensors using a single color per sensor. The authors successfully use ratiometric measurements of polarized fluorescence to enable quantification of previously described FRET reporters. This is a very exciting idea as it could substantially increase multiplexing capabilities in single cells. The authors validate the use of FLAREs in a variety of individual sensors, multiplexed with optogenetic tools and in vivo. Although I find the concept and validation of great interest, the characterization of intramolecular fluorescence anisotropy and comparison to current methods is limited. 1) The authors should explore the use of fluorescence anisotropy to measure subcellular changes in activity. One of the advantages of FRET sensors is the ability to measure spatially restricted changes in protein activity (within cell compartments), however, the paper does not address whether local activities can be monitored also by fluorescence anisotropy. In fact, given the single color nature of FLAREs, single cell comparisons of FRET vs FLARE should be possible and helpful to define how these technologies compare quantitatively. 2) The novelty of this study relies on the use of intramolecular fluorescence anisotropy to measure conformational changes. However, the relationship between intramolecular distance (or orientation) and anisotropy is not explored. These experiments could be done by using linkers of different lengths or known proteins with different structures. In my opinion, a more thorough characterization of the parameters that affect intramolecular anisotropy is needed to understand the full spectrum of limitations and possibilities of this method. 3) The authors find that a circularly permutated Venus together with wt Venus is better at changing anisotropy, but then, the comparison to other FPs is done without any circular permutation. It is not clear, from the manuscript, what are the reasons for such comparison. If circular permutation affects anisotropy, other FPs should also be permuted. 4) Most experiments to test the reporting abilities of the sensor are done under chemical perturbation with chemicals that create non physiological states (i.e. Fsk, Ionomycin, PMA). To determine whether the reporting range of the sensor is appropriate for "real" conditions, a dose-response under physiological stimulation compared to other sensors should be done. 5) The choice of fluorescent proteins in the dual sensor experiment provided in Figure 4B is unfortunate. Venus and Cerulean3 are a FRET pair. This could be confusing the interpretation of the results. Using the Cherry version in one of the two sensors would be a more appropriate choice. Overall, this study offers a novel strategy to enhance multiplexing capabilities when measuring single cell dynamics. Although the authors show multiple proof-of-principle experiments, the quantitative description of the parameters that affect intramolecular anisotropy and how it compares to FRET is poorly explored. Thus, I would encourage resubmission when these issues are addressed. Thank you for submitting your article "FLAREs: Single-color, ratiometric biosensors for detecting signaling activities" for consideration by eLife. Your article has been reviewed by two peer reviewers, and the evaluation has been overseen by a Reviewing Editor and Jonathan Cooper as the Senior Editor. The reviewers have opted to remain anonymous. The authors re-engineered a number of classic FRET-based biosensors (PKA,ERK, PKC, MLCK, calcium, cAMP) using single color FP pairs that can perform homo FRET, which can be measured using fluorescence anisotropy measurements. Since each biosensor is based on only one color, this allows for multiplexed biosensor measurements in single living cells. It also allows them to perform biosensor measurements in combination with optogenetic activation systems. Finally, the authors perform some duo-color in vivo fluorescence anisotropy measurements using 2-photon microscopy. The data convincingly shows that (cp)mVenus and mCherry anistropy sensors can be multiplexed in complex cell types and in vivo measurements. The data also shows that the (cp) mCer-sensors performs a lot worse in comparison. Overall, the concept and experimental validation reported here are of great interest for the research community and the revision improved the quality of the work significantly. However, there are still significant concerns some of which may require some additional experiments to address. 1) The authors stress that their method provides a generalizable method for (triple) multiplex imaging, and state that "The fact that FLAREs only occupy a single color channel and are highly generalizable for different biosensors, as well as color variants, highlights their utility for multiplexed imaging applications". The authors should really show that the mCer3 based anisotropy measurements are usable in multiplex experiments beyond highly sensitive calcium sensor modules and / or under physiological conditions (e.g. histamine-induced response on FLARE-mCer3 probe). 2) The authors added (Figure 1—figure supplement 1) a convincing comparison of different linkers in mVenus-mVenus anisotropy measurements. Is this a general principle that can be applied to optimize anisotropy based biosensors? E.g. is this similar for mCherry/mCerulean based anisotropy sensors? This should at least be discussed (or better shown) to provide the readers with a basis to start utilising this technique. Similarly, it would greatly help the reader audience if the authors can discuss/speculate on the reason for different performance of the mVenus-pair over the other fluorescent protein pairs in anisotropy measurements. 3) One of the advantages of FRET sensors is the ability to measure spatially restricted changes in protein activity (within cell compartments), however, the paper does not address whether local activities can be resolved also by fluorescence anisotropy. In Figure 1—figure supplement 5 authors target the reporters to subcellular compartments and show changes in anisotropy, however, I think the authors should determine whether a local activity can be resolved using a non localized sensor. For instance Matsuda et al. (PMCID: PMC3226481) show that PKC in response to TPA is activated at the membrane edge. The authors should test the spatial resolution power of anisotropic probes using their FLARE CKAR. 4) All the experiments shown in this study have been done using transfection or electroporation which results in major overexpression of the biosensor. The authors should determine whether expression level determines the reporting ability of these sensors. 5) Although it may seem obvious I think the authors should determine whether the anisotropy change depends on the fluorescent proteins being in close proximity or just the conformational change itself. Mutating one chromophore could easily address this question. - Generally: Why are the average curves (including the variance measurements) in the supplemental figures? It would be much more informative and convincing for readers to show these in the main figures instead of the current "representative example curves". - Unclear from which timepoints (or pooled timepoints?) the data in the boxplots in Figure 1B, C, 2A, B, C is calculated/compared. Figure 4E (which variance measurement is used here, how is statistical significance calculated? -> descriptions missing in legend/main text). - No (vehicle) controls in Figure 2B, C e.g. MLCK sensors can be activated by mechanical stress on cells from adding the experimental agents (it is also unclear from the "Materials and methods" section in what chamber cells were imaged, and how agents were added to the cells during experiments). We would like to express our gratitude to the editor and the reviewers for their time and effort in considering our original submission and providing suggestions for improving the manuscript. The new version incorporates a number of changes, including additional experimental data and text, in accordance with the recommendations of the reviewers. We believe that we have fully addressed the concerns raised by the reviewers. We are excited that the editor finds the concept novel and a strong candidate for publication in eLife. Monitoring multiple signaling events in parallel is important. Currently, existing co-imaging approaches remain largely confined to monitoring two activities in parallel. Monitoring three or more activities in the same cell is neither routine nor generalizable, and current examples have to be highly tailored to specific applications or highly specialized optical setups.1,2 For example, a three-parameter co-imaging study utilized a biosensor for cGMP based on blue fluorescent protein and a nonfluorescent-YFP quenching acceptor, a CY-FRET cAMP biosensor and Fura red, for cGMP, cAMP and Ca2+ co-imaging.3 We believe that FLAREs offers a generalizable way to monitor multiple activities simultaneously in the same cell, while preserving many of the advantages of ratiometric fluorescent sensors. Several examples of suboptimal conditions were used. 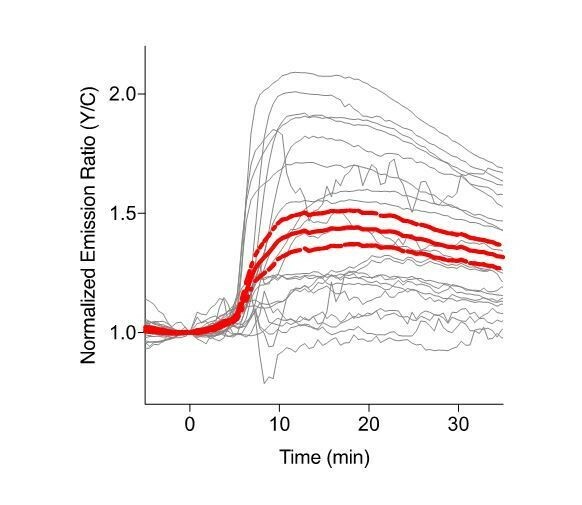 For example, cAMP and calcium oscillations in MIN6 cells are sub-maximal conditions where small oscillatory changes in second messenger levels can be monitored using the FLARE probes (Figure 4B, Figure 4—figure supplement 2). Furthermore, we demonstrate the use of FLAREs in vivo in the muscle cells of live mice (Figure 4D, E). In the revised version of the manuscript, we also include an isoproterenol dose response curve for a FLARE AKAR (Figure 1—figure supplement 3), as well as a supplementary figure showing histamine-induced responses of a FLARE calcium probe (Figure 3—figure supplement 1C). Together, these data demonstrate that FLARE probes can detect responses under physiological stimulation conditions. mCherry-mCherry FLARE-AKAR, Venus-cp172Venus FLARE-EKAR, and mCerulean3-mCerulean3 FLARE-cameleon in HEK293 cells (Figure 4A); Cerulean3-Cerulean3 FLARE-cameleon and Venus-cp172Venus FLARE-ICUE in MIN6 cells (Figure 4B); and Venus-cp172Venus FLARE-cameleon and mCherry-mCherry FLARE-AKAR for in vivo imaging (Figure 4D, E). The different biosensor combinations used in these co-imaging experiments, the different stimulation conditions and the successful demonstration of multiplexed in vivo imaging together suggest that the FLARE probes are useful for co-imaging in different contexts. In the revised manuscript, we have added an experiment to directly compare a FLARE biosensor with a FRET biosensor, as requested by the reviewer. Specifically, we co-expressed AKAR4, the current-generation FRET-based PKA activity biosensor and mCh-mCh FLARE AKAR in the same cell and co-imaged these two biosensors (Figure 1—figure supplement 4). The data show that FLARE AKAR captures all the basic characteristics of the response of FRET-based AKAR. In addition, we have included an SNR table of all the sensors and added a discussion comparing FLARE probes to the existing technology. We have also included data to demonstrate the utility of targeted versions of the AKAR sensor. There are cell-to-cell variations in terms of the dynamics of the ERK response to EGF. Some cells in the population do indeed show more transient ERK responses (Figure 4—figure supplement 1). These variations may result from variations in the expression levels of the receptor and/or other components, which may also result in differences observed in different sub-lines of HEK293T cells. We included here data from FRET-based EKAR, which shows the same response pattern and heterogeneity of the dynamics of ERK response to EGF. Specifically, on the time-scale of our experiment, some cells show a nearly-sustained response, while other show a more transient response. In the revised manuscript, we have also included more detailed characterization of FLARE sensors as the reviewers suggested (please see below). In the revised draft, we have included individual cell traces, as well as average curves with standard error of the mean for all the data shown in Figures 1-4. We have also included an SNR table to compare the performance of each sensor (Table 1). The reviewers were generally positive about the approach but suggest a number of new experiments to validate the method and demonstrate the usability, and to characterize the reporters in more depth. Although I suspect not all the experiments are necessary to address their comments adequately. If a new manuscript is submitted that addresses the point in the future, we will be happy to consult the same reviewers. We would like to thank the reviewer for the thoughtful comments. The SNRs for the FLARE biosensors were determined to be 32 for Venus-cpVenus FLARE AKAR, 10 for Cherry-Cherry FLARE AKAR, and 3 for Cerulean-Cerulean FLARE AKAR. In fact, all of the current FLARE probes show an SNR ≥3, with many above 15 (Table 1). While there is definitely room for improvement, we believe that this performance is comparable with first generation FRET sensors. We have now added a brief discussion about this point. In terms of non-optimal conditions, several examples of suboptimal conditions were used. For example, cAMP and calcium oscillations in MIN6 cells are sub-maximal conditions where small oscillatory changes in second messenger levels can be consistently detected using the FLARE probes (Figure 4B, Figure 4—figure supplement 2). Furthermore, we demonstrated multiplexed in vivo imaging using skeletal muscle of the foot of a live mouse (Figure 4D, E). It is well known that in vivo imaging presents the most challenging test of biosensor performance as reduced dynamic range is often observed in these settings. We have shown that FLARE biosensors can provide a multiplexed readout of signaling activities in vivo. In the revised version of the manuscript, we also include an isoproterenol dose response curve for a FLARE AKAR (Figure 1—figure supplement 3), as well as a supplementary figure showing histamine-induced responses of a FLARE calcium probe (Figure 3—figure supplement 1C). Together, these data demonstrate that FLARE probes can detect responses under physiological stimulation conditions. mCherry-mCherry FLARE-AKAR, Venus-cp172Venus FLARE-EKAR, and mCerulean3-mCerulean3 FLARE-cameleon in HEK293 cells; Cerulean3-Cerulean3 FLARE-cameleon and Venus-cp172Venus FLARE-ICUE in MIN6 cells; and Venus-cp172Venus FLARE-cameleon and mCherry-mCherry FLARE-AKAR for in vivo imaging. We have now added multiple cell traces as well as the average curve with standard error, as well as other relevant statistics to the supplementary information, in addition to the representative trace (Figure 1—figure supplement 2, Figure 2—figure supplement 1, Figure 2—figure supplement 3, Figure 2—figure supplement 4, Figure 3—figure supplement 1, Figure 3—figure supplement 4, Figure 4—figure supplement 1, and Figure 4—figure supplement 2). We have now added a table of the SNR for all the sensors presented in the manuscript (Table 1). There are cell-to-cell variations in terms of the dynamics of the ERK response to EGF. Some cells in the population do indeed show transient more transient ERK responses (Figure 4—figure supplement 1). These variations may result from variations in the expression levels of the receptor and/or other components, which may also result in differences observed in different sub-lines of HEK293T cells. We included here data from FRET-based EKAR, which shows the same response pattern and heterogeneity of the dynamics of ERK response to EGF. Specifically, on the time-scale of our experiment, some cells show a nearly-sustained response, while other show a more transient response. Single cell traces of EKAR2.3-EV, in HEK cells.EKAR2.3-EV with a nuclear exclusion sequence was expressed in HEK cells, and cells were stimulated with 100ng/mL epidermal growth factor (EGF) at t=0. Since this behavior was observed in a small sub-population of cells, we have now removed the specific note. We have included additional details concerning microscopy setup and image analysis, including the identification and positioning of the excitation polarizer, method for measuring and calculating the corrective g-factor, and the anisotropy equation. We would like to thank the reviewer for the thoughtful comments. We have now added the characterization of intramolecular fluorescence anisotropy and comparison to current methods. In the revised submission, we have now included examples of FLARE sensors targeted to different subcellular compartments. Specifically we have demonstrated the ability to monitor local kinase activities at the plasma membrane and the outer mitochondrial membrane (Figure 1—figure supplement 5). As the reviewer suggested, we have also added an experiment to directly compare a FLARE biosensor with a FRET biosensor. Specifically, we co-expressed AKAR4, the current-generation FRET-based PKA activity biosensor, and mCh-mCh FLARE AKAR in the same cell and co-imaged the two probes (Figure 1—figure supplement 4). The data show that FLARE AKAR captures all the basic characteristics of the response of FRET-based AKAR. The anisotropy measurement in these experiments is a way of quantifying homoFRET. The relationship between intramolecular distance and anisotropy can therefore be predicted based on the theory of FRET. To validate this, we have now included the requested experiment (Figure 1—figure supplement 1) that shows the relationship between linker length and fluorescence depolarization using mVenus. A single mVenus emits light with the highest measured anisotropy, whereas two tandem mVenus:mVenus fusion constructs both displayed reduced anisotropy due to FRET. The shorter linker construct exhibited a greater reduction compared with the longer linker version due to the higher homo-FRET efficiency. We have now included data on cp173-mCerulean in the acceptor position for the FLARE AKAR (Figure 1C). We have shown that EGF-induced ERK activity can be detected by FLARE-EKAR. In the revised draft, we have now included a dose-response curve of FLARE AKAR using the β-adrenergic receptor agonist isoproterenol (Figure 1—figure supplement 3). Furthermore, we have also included calcium measurements from stimulation of Gq-coupled receptors with histamine (Figure 3—figure supplement 1C). These experiments demonstrate the capability of the FLARE sensors to report physiologically relevant responses. While we agree that the broad spectral properties of FPs allow for many potential FRET combinations, including mCerulean3:Venus, mVenus:mCherry, and even EGFP:mCherry, each of these combinations has been widely used for non-FRET two-color experiments.4,5 The imaging conditions we use prevent bleedthrough of fluorescence into non-specific channels, permitting clear and complete separation of mCerulean3 and mVenus fluorescence (Author response image 2). a). Agarose beads were separately labeled with recombinant mCerulean3 or mVenus. 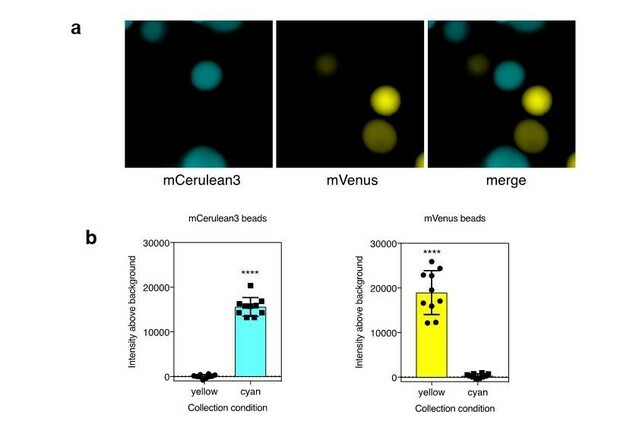 Imaging was performed using collection conditions specific for mCerulean3 or mVenus. b). The fluorescence intensity above background was measure for CFP and YFP labeled beads in each channel (n=10 beads per fluorescent protein; ****, p < 0.0001 by t-test. 1) Depry C, Mehta S, Zhang J. Multiplexed visualization of dynamic signaling networks using genetically encoded fluorescent protein-based biosensors. Pflugers Arch. 2013;465(3):373-81. 2) Carlson HJ, Campbell RE. Genetically encoded FRET-based biosensors for multiparameter fluorescence imaging. Curr Opin Biotechnol. 2009;20(1):19-27. 3) Niino Y, Hotta K, Oka K. Blue fluorescent cGMP sensor for multiparameter fluorescence imaging. PLoS ONE. 2010;5(2):e9164. 4) Markwardt ML, Nkobena A, Ding SY, Rizzo MA. Association with nitric oxide synthase on insulin secretory granules regulates glucokinase protein levels. Mol Endocrinol. 2012;26(9):1617-29. 5) Gaal T, Bratton BP, Sanchez-vazquez P, et al. Colocalization of distant chromosomal loci in space in E. coli: a bacterial nucleolus. Genes Dev. 2016;30(20):2272-2285. We demonstrated that the mCer3-mCer3 FLARE cameleon sensor could be used to monitor calcium oscillations in Min6 cells in co-imaging experiments with mVenus-cp172Venus FLARE ICUE. The calcium responses are submaximal in this context. In addition, in this revision we included two additional multiplexed co-imaging experiments to demonstrate that the mCer3 FLARE sensors could detect physiologically relevant responses. First, we performed a co-imaging experiment of mCer3-mCer3 FLARE Cameleon, mCh-mCh FLARE AKAR, and Venus-cp172Venus FLARE EKAR in HeLa cells, with Fsk/IBMX, EGF, and histamine stimulation (Figure 4—figure supplement 2). In the HeLa cells, calcium transients were observed both after EGF stimulation and after histamine stimulation. Furthermore, we also co-imaged mCer3-cp173Cer3 FLARE AKAR and Venus-cp172 Venus cameleon with 100nM isoproterenol, a physiological stimulant, and thapsigargin (Figure 4—figure supplement 3). Changes in anisotropy were observed in both channels upon the appropriate stimulation. We performed the experiment comparing the anisotropy of monomeric FP, and dimers separated by linkers of two different lengths for mCherry and mCerulean3, in addition to mVenus (Figure 1—figure supplement 1). A similar trend was observed. Monomeric FPs had the highest anisotropy, followed by dimers separated by a long linker, with dimers separated by a short linker having the lowest measured anisotropy. This observation is consistent with our understanding of homo-FRET, with increased FRET efficiency corresponding to a decrease in anisotropy of the emitted light. For FLARE sensors, like FRET sensors, it is difficult to know a priori which FPs or FP combinations will yield the greatest dynamic range. However, we have observed for a number of different sensors that the mVenus based ones tend to perform better. We speculate that this is because mVenus is both a good FRET donor and a FRET acceptor because of its excellent quantum yield and extinction coefficient. The PKC sensor in Matsudaet al. contains the C1 domain of PKCβ at N-terminus and translocates from the cytosol to the plasma membrane upon activation, which is conveniently used to enhance the detection of the membrane activation event. To demonstrate the ability to monitor localized activity using an untargeted FLARE sensor, we used mVenus-cp172Venus FLARE AKAR in HeLa cells and stimulated the cells with Fsk/IBMX. We observed clear differences, both in terms of the kinetics and the magnitude of the signals (Figure 1—figure supplement 8), demonstrating that localized signals can be distinguished using non-localized probes. A scatterplot of anisotropy change vs. intensity (expression level) has been added for the Venus-cp172Venus FLARE AKAR and mCherry-mCherry FLARE AKAR as examples (Figure 1—figure supplement 3). In general, the expression level does not significantly impact the reporting ability of these sensors. We mutated the chromophore of the C-terminal cp172Venus in Venus-cp172Venus FLARE AKAR from GYG to GGG, and performed anisotropy imaging of this sensor in HEK cells with Fsk/IBMX stimulation of PKA (Figure 1—figure supplement 5). This mutation did not completely abolish the response but instead reduced the response amplitude to about one-third of the wildtype biosensor. The anisotropy change was not completely abolished, presumably, because of intermolecular FRET occurring between biosensor molecules. 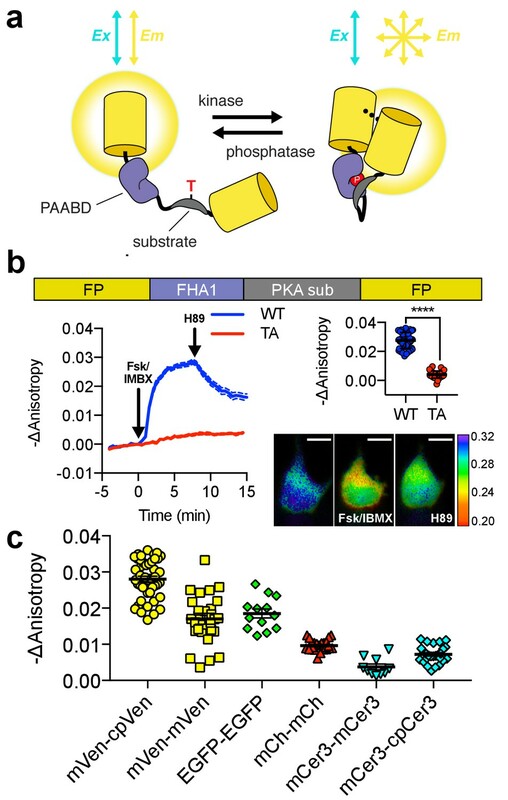 After stimulation of PKA activity, it is possible for a proportion of the FHA1-PKA substrate interactions to occur between two adjacent sensor molecules, resulting in FRET and subsequently a slight change in measured anisotropy. We think it is unlikely that the anisotropy changes observed in the FLARE sensors are due to a change in the rotational mobility of the molecules. It has been shown that the rotational mobility of FPs occurs on a timescale much longer than the lifetime of the fluorescence. Thus the contribution to a change in rotational mobility due to a change in the shape of the sensor to the dynamic range should be negligible. We have replaced the representative curves with average curves with standard error of the mean in the main figures (Figures 1, 2, and 3). However, for the co-imaging experiments we have kept the representative curves in the main figure to emphasize the single-cell nature of this technique (Figure 4). Time points for calculating these responses have been included in each figure legend. The fact that the mean and standard error are represented in the dot plots has been added to the appropriate figure legends. Descriptions of statistical tests have also been added. For the Venus-cp172Venus FLARE CKAR sensor, a negative control in which the phosphorylatable threonine in the substrate was mutated to an alanine was added (Figure 2B, Figure 2—figure supplement 3B). A vehicle control was added for the FLARE MLCK sensor (Figure 2C). E.g. MLCK sensors can be activated by mechanical stress on cells from adding the experimental agents (it is also unclear from the "Materials and methods" section in what chamber cells were imaged, and how agents were added to the cells during experiments). An explanation has been added to the Materials and methods section. We would like to acknowledge Sohum Mehta for his help in creation of graphics as well as critical reading of the manuscript. This work was supported by: NIH R35 CA197622, R01DK073368, and R01MH111516 (to JZ), as well as by R01DK077140, R01HL122827, and R01MH111527 (to MAR). Animal experimentation: All work involving mice was performed in accordance and recommendations of the NIH's Guide for the Care and Use of Laboratory Animals. Work was performed under protocols approved by the University of Maryland, Baltimore's Institutional Animal Care and Use Committee (protocol # 1213012). Procedures were performed under isoflurane anesthesia to minimize suffering. © 2018, Ross et al.